A few weeks ago I had the opportunity to attend the EAT. LEARN. CELEBRATE. event at NAIT. 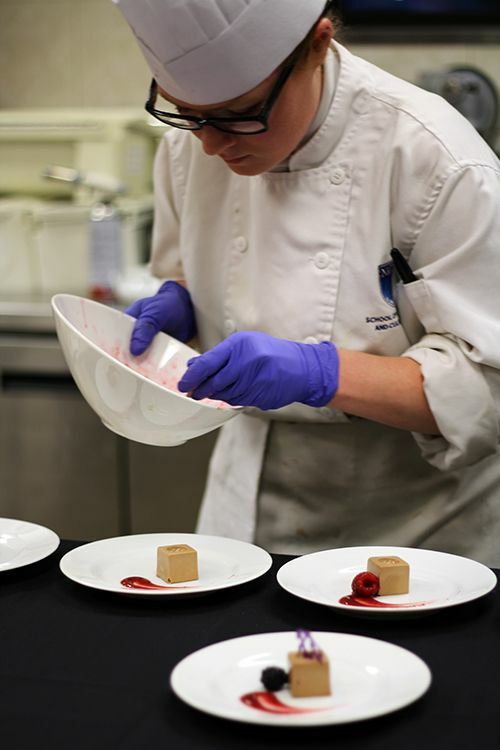 Alongside some other local food bloggers and foodies, I received a preview of all the food that NAIT has to offer, including Ernest's fall menu and a look at what the culinary arts program offered on campus. 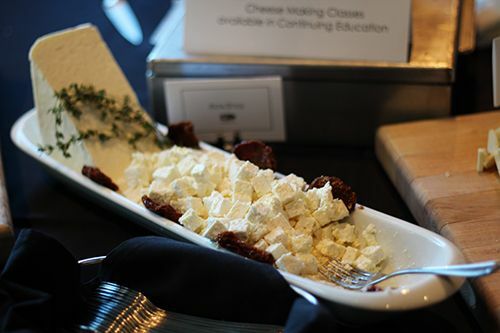 Throughout the evening it was such a treat to sample different artisan cheeses, cured meats, and breads made by the culinary students. All the food sampled was excellent and I can really tell that this program prepares students well to work in some of the finest kitchens out there! 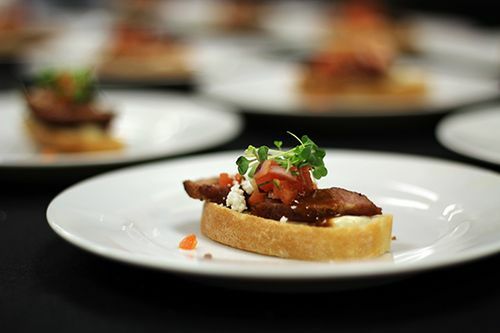 Ernest's dining room was transformed into a place for guests to congregate and sample the different products made by culinary students at station-style displays. 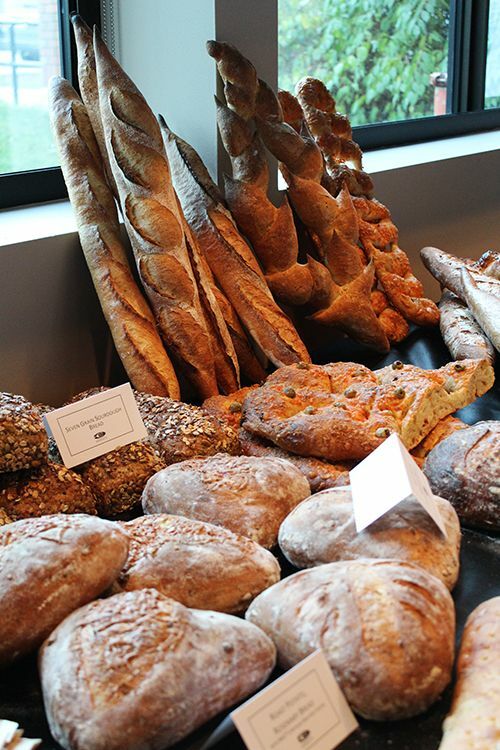 My favourites by far were the breads and charcuterie. Olive & jalapeno focaccia, seven grain sourdough, roast potato and rosemary bread... the list went on and on and all the breads were soft and fresh. On the charcuterie side, students learn to butcher, prep, and cure meats. I have to say that their beef jerky is quite addicting, and lucky for everyone the breads, meats and cheeses are available for purchase in the Retail Meat Store and Common Market. 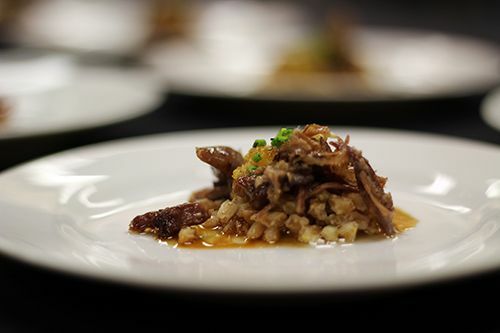 The kitchen was open for guests to explore that evening, and many dishes off Ernest's fall menu were being offered to guests. The level at which the students are trained is really to be admired. They're taught to embrace local producers, they treat the ingredients so well by bringing together fantastic flavours, and the finished plates are beautiful! 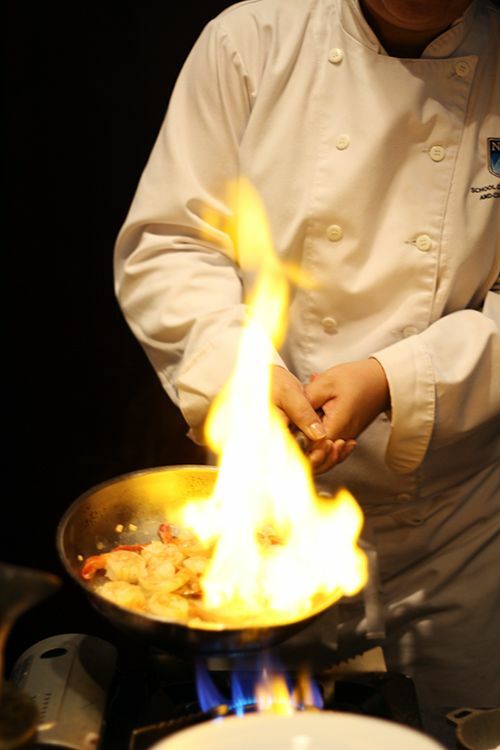 Many different cooking techniques are learned and showcased through Ernest's menu, the students should really be proud of each dish that leaves the kitchen. 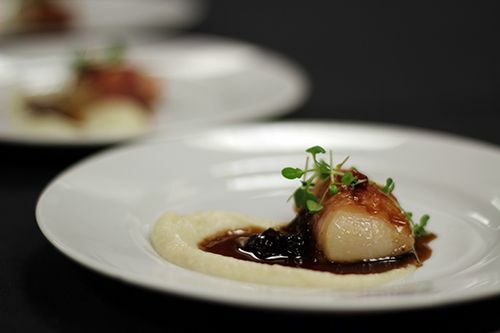 The dishes in the kitchen were excellent and showcase the talents of all the students trained in the culinary program. All the dishes I tried that evening were well executed and I'm sure the sit-down dining experience would be fantastic. I know I will be back for a sit-down dinner at Ernest's to try bigger portions of these sample dishes, and I encourage you to do so as well if you have the opportunity! Ernest's is a hidden gem here in the city, but now the secret is out! Take a look at their menus here and stop by for a meal! This fall season I've been obsessed with finding the perfect hat. 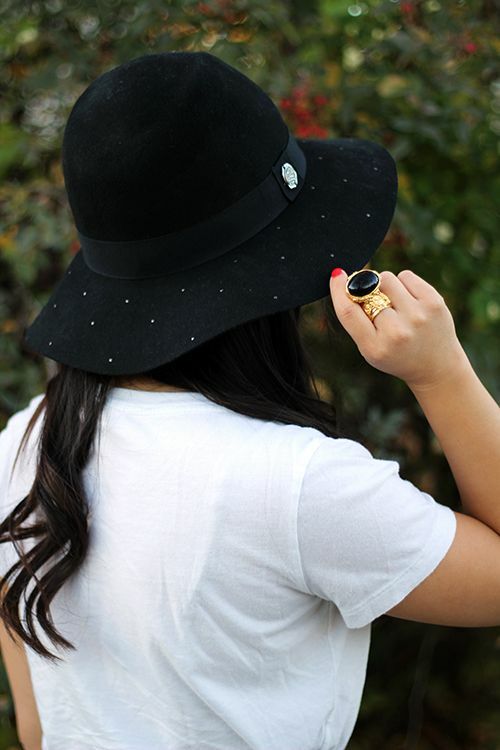 Fall is the perfect time to layer with accessories, and a hat is no exception to the rule. On a recent trip down to Calgary I had some time to stop by Canada's first Nordstrom. Walking around the crowded store, I saw this hat from a mile away and knew it was perfect for this season. The floppy fedora style fits so well and I love the extra little studs that give it some personality. It's the perfect add on for all my fall outfits and I couldn't be happier with it. Anyone else obsessing over hats this season? Growing up in Alberta, Earls restaurants have been around for practically my entire life. I've often associated the restaurant group with burgers and beer, because that's usually what everyone orders whenever I've dined there. Two weeks ago I had the chance to stop by the flagship Earls Tin Palace here in the city to get a peek at the new fall menu. This past summer Earls Kitchen + Bar opened a brand new test kitchen in the 2nd floor space above the Hornby Street location in downtown Vancouver. 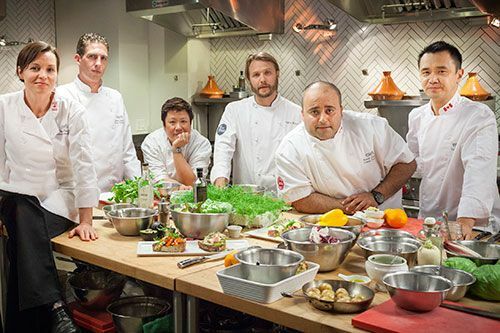 The test kitchen is not only open to the public for viewing, but the chefs working in the kitchen seek feedback as they test new dishes day in and day out. With the talented chefs working together under the roof of the test kitchen, they've become known as the “Chef Collective.” Together they have been working hard on the fall menu and it is finally here. Sitting down at the dinner table I was surprised by the assortment of dishes on the menu. Given that I've always been to Earls for burgers and drinks, I was surprised to find that a lot of dishes were trendy and quite sophisticated. There is a clear Asian influence for many of the items on the fall menu, but I'm not complaining! Throughout the evening we were able to sample numerous dishes on the menu, but for me a few were more noteworthy than the others. The first dish that surprised me was the BBQ Pork Buns ($11) served up in a bamboo steamer as a set of three. 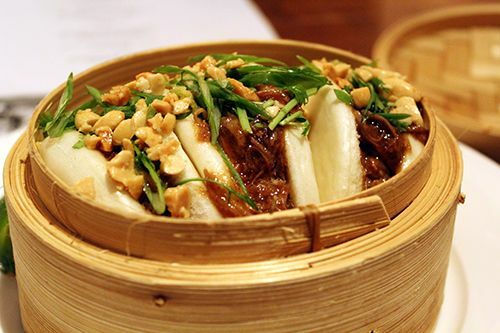 Tender BBQ pork is served with hoisin hot sauce, cilantro and roasted peanuts all nestled within a soft "bao," an Asian-style steamed bun. I never would have expected to see this Momofuku inspired dish, and Earls executed this dish wonderfully. The bun is soft and light and the mix of sweet and spicy flavours in this dish work really well together. An optional addition of a fresh squeeze of lime brings out the flavours even further. 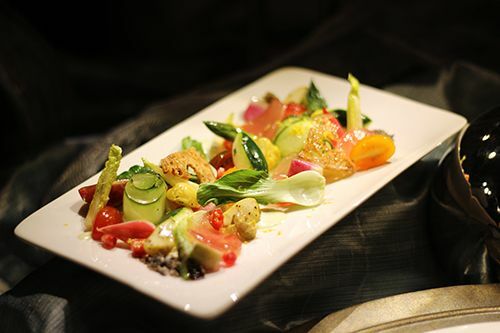 This dish is great shared with others as a starter and I would highly recommend you try it out! The next dish that I really enjoyed was the Crispy Thai Prawns ($13). 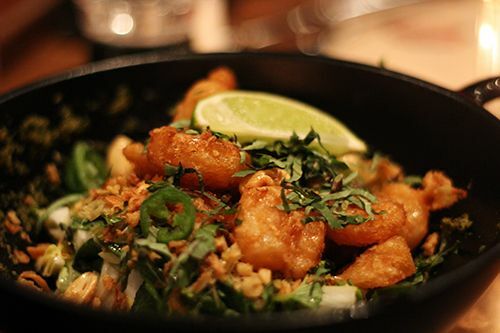 This dish features crispy deep fried prawns in a sweet and sour glaze on top of a bed of napa cabbage, Thai basil, jalapenos, cilantro paint, and roasted peanuts. One bite of this Asian-style salad and I was hooked. It was a personal shocker for me as I hate all things cilantro, but the flavours in this dish are fantastic. You have savoury umami and tangy notes from a fish sauce and lime juice based dressing, great crunch from the cabbage, slight heat from the jalapenos, and fragrant notes from the herbs. The prawns are golden and I think this dish would be amazing served with some rice. The last savoury dish of the evening that I really enjoyed was the Thai Vegetable Bowl ($15) which actually happens to be vegan friendly. 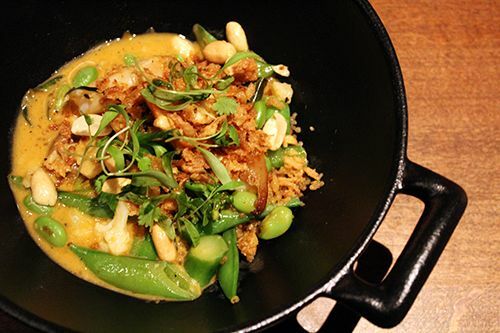 The bowl consists of quinoa, crispy onions, peanuts, edamame, seasonal vegetables, and coconut in a delicious lemongrass broth. It is tangy, spicy, and creamy, and you also have the option of adding tofu, chicken, or prawns for protein. To round off the meal we got the try the new Chocolate Hazelnut Bar ($8) and it currently ranks pretty high on my list of all-time favourite desserts. This isn't a solid bar of chocolate, but rather a smooth, dark chocolate shaped into a bar with a crispy feuilletine base. 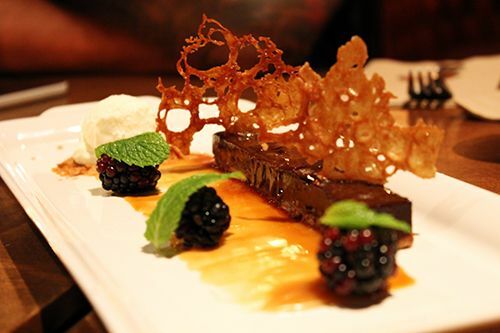 The chocolate is rich without being overly sweet, and having a wafer-like crunch from the feuilletine bits in each bite makes this dessert stand out for me. Served with blackberries, a smear of salted caramel and a scoop of vanilla bean gelato - you've got a perfect dessert right here! I've never paid much attention to the seasonal menu changes at Earls, but if this preview dinner taught me anything it's that I should be keeping Earls on my radar. The Chef Collective has brought forth some pretty solid dishes and I feel like there will be lots more to look forward to with future menu changes. Go out, try the dishes, and let me know what you think! Disclaimer: as this was a media event, views expressed in this post are solely mine. I was not expected to feature this restaurant on my blog, nor obligated to do so. This post is 100% my opinion, and as always, my priority is to you, the reader, to present an unbiased, thorough review. There's a sandwich shop that has been causing quite the buzz in the Edmonton food scene for the past few months. I've never been a huge sandwich person. I mean, I would happily take a hot bowl of noodle soup over a sandwich any day. But sometimes there are those days where I just crave a really good sandwich. 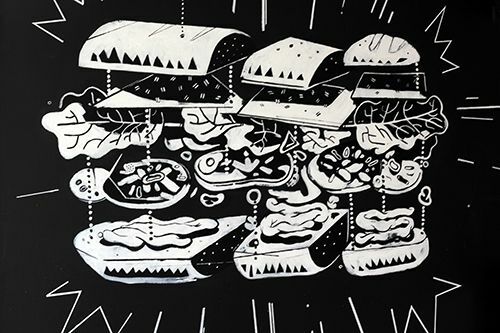 The minds behind Three Boars Eatery are those behind Farrow, and this sandwich shop is located conveniently next door. 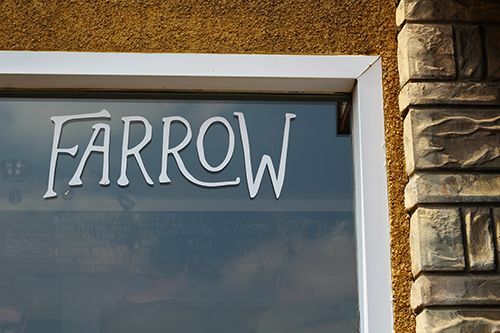 Like Three Boars, the space is tiny and seating is limited, but in the summer the picnic tables out front are a perfect spot to enjoy your lunch and soak up some Vitamin D.
When Farrow is open for business they're serving up sandwiches and coffee to the hungry crowds from 7AM - 2PM. Being in the university area it's great place to stop for breakfast whether you're on your way to class or work. But for me, I popped in on a random afternoon for a quick bite as I was in the area. The menu changes often, and out of the choices available that day I went with the Grick Middle ($7): bacon, fried egg, greens, tarragon aioli, tomato jam, smoked cheddar. I am a sucker for fried eggs in sandwiches and burgers, especially when the yolk is golden and runny. There wasn't a big burst of flavour like I was hoping for, but the flavours in the sandwich complemented one another. The oozing egg yolk tied everything together and overall it was a good sandwich. My boyfriend went with the Chief Beef ($8): roast beef, pickled onion, chips, arugula, horsey mayo. The sandwich was substantial and full of fixins, but what I enjoyed most was the added crunch from the chips! It really changed up the texture of the sandwich, and I'm thinking I may need to sneak a few chips into the next sandwich I make for myself. When you're in the university area and in a bit of a rush, Farrow might be the perfect spot for you to grab lunch on the go. Most sandwiches are $7-$8 and they have options to cater to the vegan crowd too. 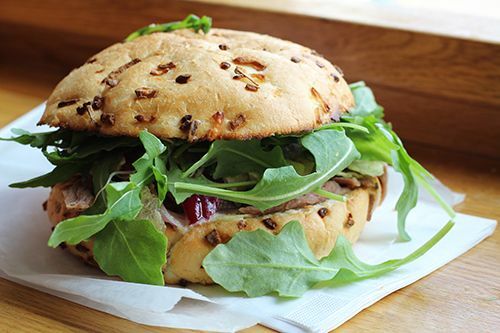 With a wide range of sandwich combinations and their willingness to support local producers - what isn't to love? Sometimes it’s the little things that make or break your day. For me, it’s always the little things that brighten my day – seeing the brightly coloured produce at the farmers market, having a sweet treat in the afternoon, or simply sitting down with my whole family for dinner. Edo Japan recently launched a campaign with the intention to make your day #simplybetter. It can be something big, or it can be something small. The company is looking to make someone’s day simply better and it could be you! They are seeking submissions from the public that describe what makes their day better – and they want to help make it come true. So what makes my day #simplybetter? Ever since graduating with my second degree a few weeks ago, life has been a crazy rollercoaster ride. Starting a new career has been so exciting, and balancing it with blogging and my personal life has definitely been a bit of a challenge. My boyfriend has a hectic schedule, so in combination with mine it has been difficult to find time to spend together. So what makes my day simply better is just having the opportunity to spend time with my boyfriend in the kitchen either baking or cooking. Cooking a meal together is a favourite past time of ours and we love testing out different recipes together. Edo Japan extended the opportunity for me to make my day simply better by providing me with a $50 gift card to make my wish come true. I jumped at the opportunity to take a baking class offered through St. Albert’s Dig in Fest last weekend. 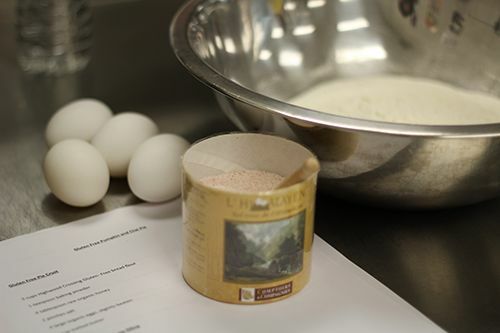 The class was taught by Karine Moulin, a competitor on season 4 of Top Chef Canada, and pastry chef at Hotel Arts in Calgary. We were both so excited to take part in her class as we rooted for her while she was on Top Chef earlier this year. 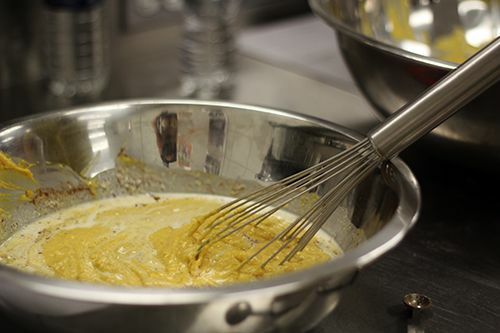 As Thanksgiving was right around the corner, Karine taught the class how to make a gluten free pumpkin and chai pie. 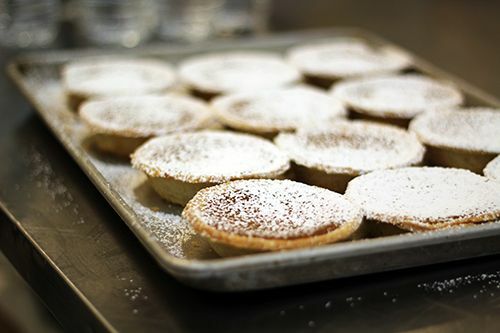 Pumpkin pie is a must for me during this time of year, and the inclusion of chai spice was just the icing on the cake! The one hour class was so much fun and it was such a great feeling to be in a kitchen working alongside my boyfriend. We had so much fun and learned new baking tips and tricks along the way. Oh and I forgot to mention that the pie was amazing! I don’t think I will ever eat a plain ol’ pumpkin pie again. So we both want to send a huge thank you to Edo Japan for sending us to the cooking class and making our day simply better. Although we have cooked together many times, it just felt so different learning and working together as a team in the kitchen. I would highly recommend taking a cooking class with your significant other – it’s so much fun! So what makes your day #simplybetter? Hop on over to the Simply Better website and submit your moment. It may just come true! 1. 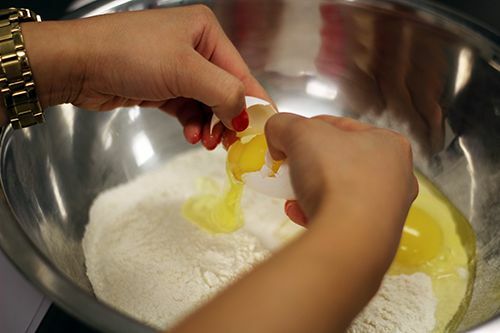 Combine all crust ingredients together by hand until combined, roll into a ball and refrigerate until firm. 2. When the crust is ready, roll out and fit into pie pan. Crimp edges and set aside in the refrigerator until chilled. 3. Combine all filling ingredients together until just blended. 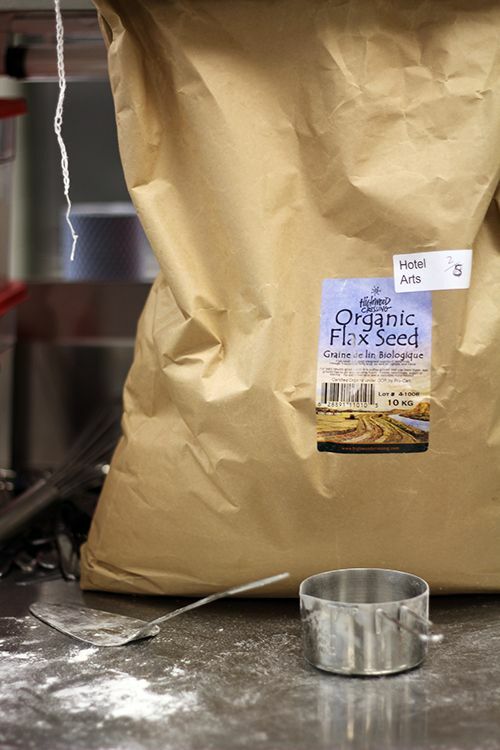 Pour batter into pie crust. 4. Bake at 360'F/182'C for 10 minutes. Remove and line edges of crust with foil. 5. Return to oven and reduce heat to 325'F/163'C and bake for 40-50 minutes or until a toothpick comes out clean. 6. Place in refrigerator to cool. Serving suggestions: top with whipped cream and a dash of cinnamon sugar / top with icing sugar and brulee, finish with freshly whipped cream. I've been doing quite a bit of travelling this year, and the one thing that always stumps me is how to properly pack and store my jewelry while I'm out and about exploring the world. Do you have any tips and tricks? The following tips will help you protect and manage your jewelry wherever you travel! Travel LightSelect items that you can wear throughout the day or evening and choose the ones that go with most of your outfits. Keep a register of all your precious jewelry and make copies. Leave one at home and take one with you on your travels. 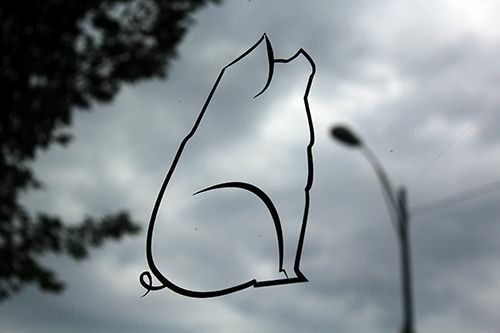 A video or photograph of special pieces is also helpful for replacement or insurance purposes. Purchase Inexpensive JewelryThe risk of losing valuable pieces can cause stress during your vacation. A simple solution is to purchase jewelry items that have the appearance of real diamonds and gold, but are available at stores such as Michael Hill for a fraction of the cost. Fake diamonds look almost real, but with the advantage of no panic attack if they are stolen or get lost. 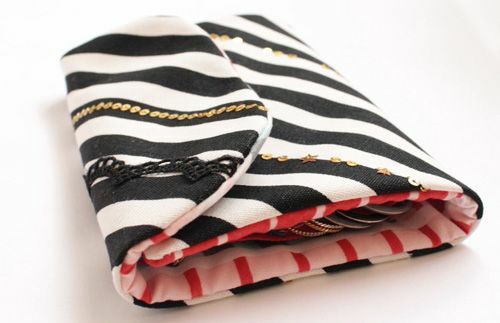 Travel OrganizersA travel organizer for your jewelry will help manage smaller pieces while avoiding damage to jewelry. Excessive exposure can harm items. Some metals may tarnish and scratch. Avoid excessive wear and tangled chains by placing items in a separate case. 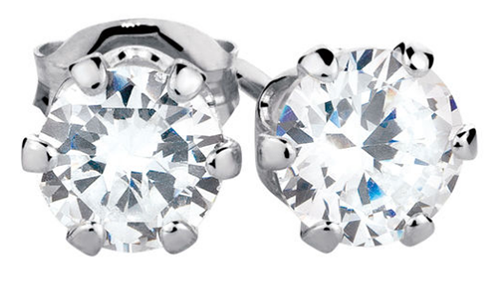 Check regularly in order to make sure that stones and clasps have not become loose or broken. Keep Valuables with YouPlace items in your carry-on luggage or wear pieces that are more expensive. Avoid placing any valuables in luggage that you plan to check at the airport. Slip necklaces beneath the neckline of your shirt and turn your diamond ring so that the stone doesn’t show. Carry personal belongings with you while checking into your hotel room. Insure Valuables Insurance policies can help protect valuables for a nominal amount. Reliable insurance will cover your fine jewelry wherever you go, assuring you peace of mind. Happy Monday! It's Canadian Thanksgiving Monday and I've been spending as much time as I can with family. I just wanted to take a moment to say how thankful I am to have the support from everyone who reads my blog! Your encouragement means the world, and I am so happy that I am able to continue to blog and do what I love! Thank you, thank you, thank you! 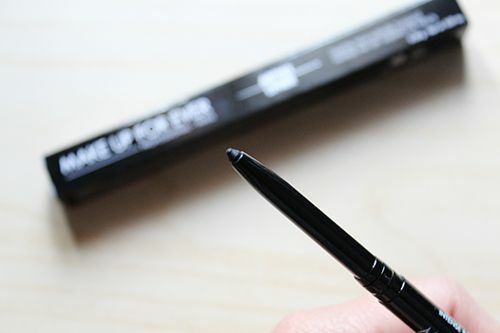 Moving onto today's post, I have to gush about this new eyeliner that I'm loving. 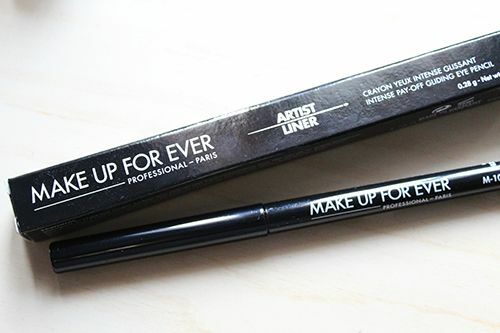 Last month Make Up For Ever launched Artist Liner, an eyeliner that promised to be highly pigmented and smooth gliding. To be honest I've never been a fan of pencil liners. I find that they always smudge and give me panda eyes, which is why I only ever use liquid or gel liners. The Artist Liner looks just like your usual liner, but with a twist-up design it means there is never a need for sharpening. However, the trade off for a twist-up design is that you get less product than that of a pencil liner. The eyeliner is very sturdy as it is housed inside the shiny black plastic that Make Up For Ever is known for. The diameter is smaller than that of a pencil, making it easy to hold onto. Reading the description of the Artist Liner, I was pretty skeptical of its promises to be smudge proof and long wearing. But let me tell you, this product definitely lives up to it's claims! 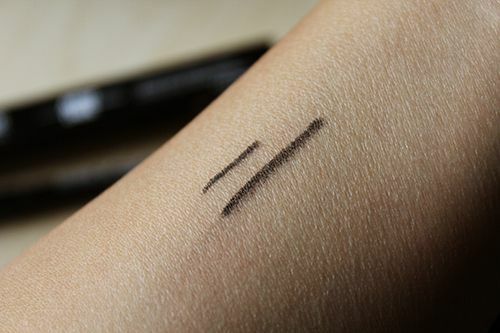 I tested out matte black (shade M10) and one light swipe gave a highly pigmented swatch, as seen above. The formula is creamy, and blendable as long as you work quickly. I found that immediately after application the formula was blendable for a very short (we're talking seconds here) period of time. 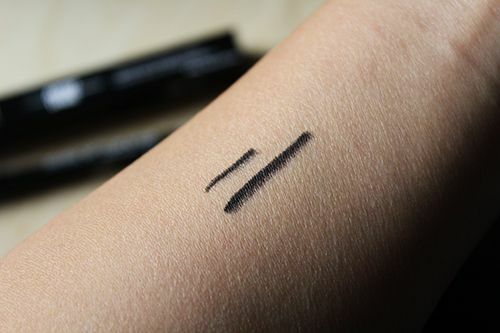 The formula almost seems to set right into your skin...that eyeliner isn't going anywhere! After my swatch I vigorously rubbed over the area where I applied the product. As you can see, the formula lightened up a tiny bit but it did not budge. The eyeliner survived an 8 hour workday without any problems other than lightening up a tiny bit. This formula is a dream come true for me! If you're after a highly pigmented, long wearing eyeliner in pencil form, look no further. The Artist Liner is available in 15 different shades with matte, metallic, iridescent, diamond, and satin finishes - there is something for everyone! Available via Make Up For Ever Boutiques and Sephora across Canada for $24. *Disclosure: This product was sent for consideration of a review. Ever since I had brunch at Cucina in Calgary I needed to go back for more. And while I haven't had the chance to return, something different has come on my radar. Recently two of the chefs who worked at Cucina, John Michael MacNeil and Alison Bieber, co-opened a brand new restaurant (and got married!). For me that meant saying "bye bye" to Cucina and heading to Black Pig Bistro on my next trip to Calgary. 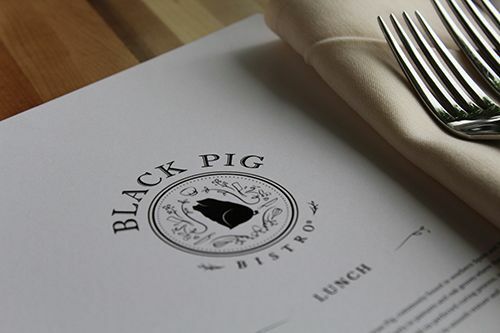 Black Pig Bistro gets its name from the Black Iberian Pig, native to Spain and Portugal. 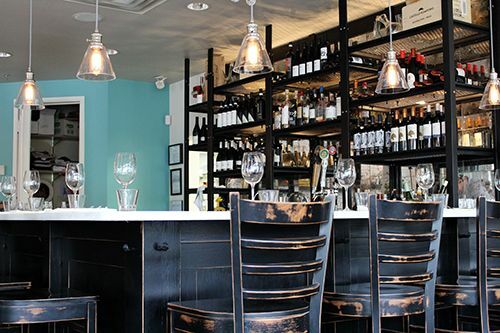 The restaurant opened earlier this year in the Bridgeland area of Calgary and has even been nominated to win the title of Enroute Magazine's 2014 People's Choice Award for Best New Restaurant. With the opportunity to drop by on the way to Banff, you bet I convinced my boyfriend to stop for lunch! We arrived late on a Saturday afternoon to a quiet restaurant and were seated right away. As we walked to our table I eyed the Jamon Iberico behind the bar and immediately fell in love with the decor. The light teal, white, and black contrasted against one another is one of my favourite colour combinations, and happens to be the colour scheme in my room. Bonus points! With so many great options on the menu, my boyfriend eventually decided on the Serrano Ham & Cheese Sandwich ($15): smoked pepper aioli, manchego and fresh tomato on a baguette. The sandwich came out to the table with a side of housemade pickles that were a mix of sweet and sour, a little spicy, and deliciously crunchy. 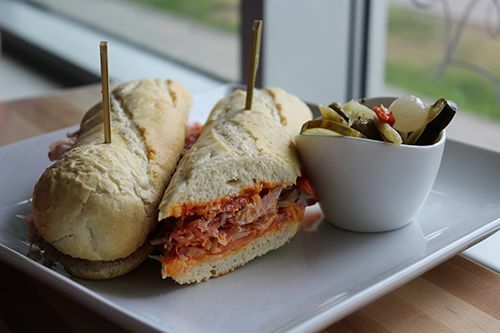 Black Pig Bistro has taken the classic ham and cheese sandwich and elevated it with the use of quality ingredients. 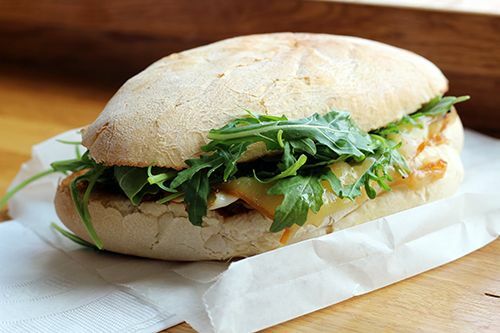 The serrano ham combined with the manchego are delicate but give the sandwich an almost creamy consistency. Add in the tomato for texture, slap it inside a soft baguette with a crunchy crust, and you've got a pretty stellar sandwich. The sandwich was so easy to eat and was a great portion size for lunch. As the self-proclaimed glutton in our relationship, I chose to go with the three course lunch for $25. 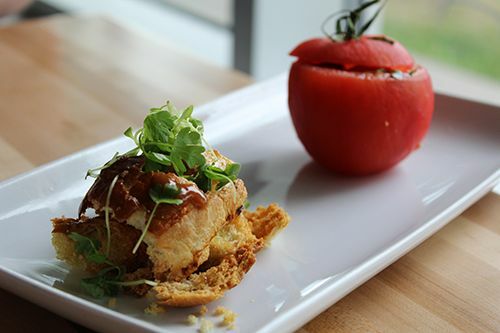 First up was a Tomato Tartar with a sherry vinaigrette over garlic croutons. I loved the presentation on this one since the top of the tomato acted as a lid to lift and reveal the tartar below. Inside the tomato was a bruschetta salad of sorts, well flavoured with salt and basil. The crunchy croutons were a great accompaniment as they were extra garlicky, and the vinaigrette added a tangy punch. 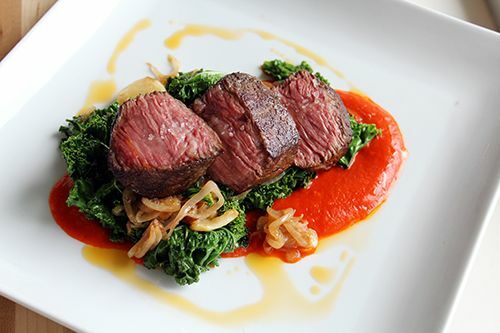 My main course was a Sous Vide Alberta Beef Sirloin with roasted shallots, pine nuts, kale and piquillo pepper sauce. When the dish was presented before me, all I could think was "wow!" Look at the colours on that plate and how beautiful our Alberta beef is. The sirloin was a perfect medium rare and lightly seasoned to allow the true flavour of the meat come through. I loved the mild kick of heat from the pepper sauce, and the lightly sauteed kale was tasty on its own or combined with the dish. The flavours were incredibly well balanced, and it wasn't long before a fork from the opposite end of the table came to help me out. 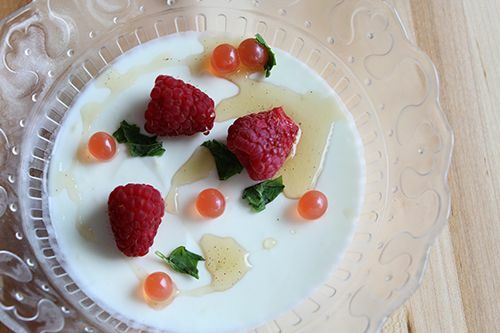 The last course to my lunch was a Honey Yogurt Mousse with raspberries and pomegranate pearls. The mousse had the consistency of a thickened panna cotta, and it was nice and tart on its own. In combination with the honey and other accompaniments it was a perfect light finish to the meal. Black Pig Bistro surely didn't disappoint, and I was already thinking I needed to return for dinner on a subsequent trip. Lunch service was quick and our server was very attentive to our needs. 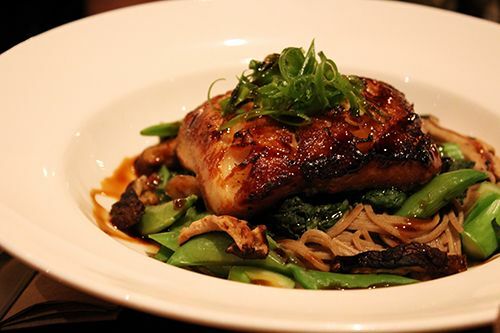 If you're in Calgary for lunch you should definitely consider stopping by for the $25 three course meal! You get delicious food and great bang for your buck!